I’ve covered the Treepies which include the generas Dendrocitta, Crypsirina, Temnurus and Platysmurus. They all have long tails and live high in the trees, preferring to stay up high and not visiting the ground much. There are 11 species within these generas. They are mostly found in Asia and India. They are beautiful with their long tails and elusive. 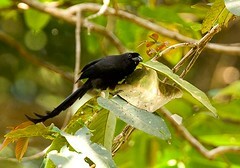 Many are threatened or near threatened and endemic to particular regions.